Renovated in 2006, this 21-storey city hotel offers guests a choice of 663 rooms and suites, world-class conference and recreational facilities and superb restaurants. Further facilities on offer include an entrance hall with 24-hour reception, a hotel safe, a currency exchange facility and lift access. Guests may also make use of the on site hairdresser, restaurants and public Internet access. The hotel's business centre provides services such as conference arrangements, translations, couriers. 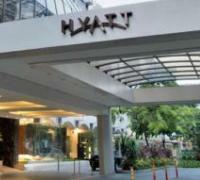 The Grand Hyatt Hotel Singapore is situated in the heart of the Orchard Road shopping area, very close to the Central Business District and just 10 minutes from the financial district. Thus, the best financial, business, shopping and entertainment facilities Singapore has to offer are within easy reach.